After almost a decade in the wilderness, the original loop‑based sequencer is back. But is Acid still the best? In all walks of commercial life, brands and products come and go, particularly when economic times are challenging. Music technology is not exempt from these harsh realities. We have, for example, just witnessed the apparent death of Cakewalk’s Sonar only to see it resuscitated by BandLab Technologies. Not all such stories have happy endings. 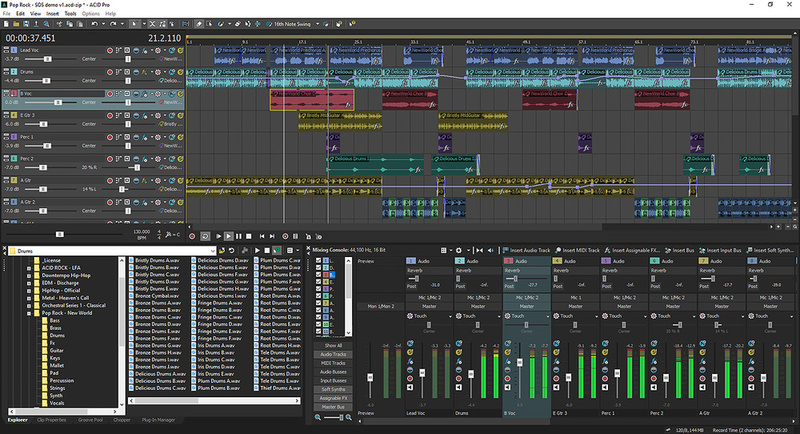 There’s another Windows‑based music production platform whose users might have had more than the occasional moment of doubt over the last few years: Acid Pro, originally developed by Sonic Foundry and later by Sony Creative Software. I’m a long‑term Acid user, and have reviewed various releases of the program for SOS over the years. However, the most recent of those reviews appeared back in the April 2009 issue when Acid Pro 7 was released. Apart from a few maintenance updates, that’s remained the current version — until now. A further change in Acid Pro’s ownership took place in 2016, when Magix acquired the former Sonic Foundry product range from Sony. Sound Forge and Vegas have already received major updates under Magix’s ownership, and now Acid Pro has received the same treatment. Some 20 years after it was first released, and nearly 10 years since the last major update, Acid Pro 8 is here. Of course, the world of DAWs, sequencers and other music production tools has not stood still over the last decade, so where does Acid now stand in what is a very crowded music production software market? For those with somewhat fewer music technology miles on their clock, it might be difficult to imagine the stir that Acid made when it first appeared. Its unique selling point was its ability to match the tempo and pitch of pre‑recorded audio loops, in real time — at a time when mainstream sequencers such as Logic and Cubase had only recently added audio recording to their core MIDI feature sets. Acid brought a completely new paradigm to computer‑based music‑making, and although some rather uncharitably described its loop‑based approach as the musical equivalent of painting by numbers, it made a significant impact. Acid Pro’s real‑time pitch‑shifting and tempo‑matching tools are second to none and, as shown here, pitch‑shift can be applied globally from the timeline or at the clip and event levels, with drum loops excluded from the pitch‑shifting process unless you specify otherwise.Acid’s incredible ease of use meant that it offered a means of music production that almost anyone could get creative with, and the ‘Acidized’ audio format, in which audio loops were saved as files containing tempo and root‑note metadata, soon became a standard with sample library developers. Sonic Foundry, and subsequently Sony, gradually added to the core feature set with ever‑better pitch and tempo‑manipulation algorithms, an excellent groove‑based audio quantising system, and ReWire support. Eventually, as other sequencers started to acquire their own tools for pitch‑shifting and tempo‑matching audio loops, Acid struck back with DAW‑like features such as audio recording, MIDI sequencing, plug‑in support for virtual instruments and effects, expanded mixing capabilities and automation. By the time of version 7, Acid Pro provided an all‑round music production environment, albeit one that still retained a loop‑based focus. Despite its age, Acid Pro 7 has continued to work well under different iterations of Windows. Elsewhere, however, things have moved on: loop‑based options are now present in most popular DAWs, and there is direct competition from the likes of Ableton Live, Bitwig Studio and FL Studio. So, while Acid Pro was the undoubted king of the loop castle for the first few years of its life, anyone coming to this way of working more recently will have been faced with plenty of choice. As well as its original loop‑based feature set, Acid Pro is also a capable multitrack audio recording package and a MIDI sequencer. So what’s new in version 8? Perhaps the most significant change is that Acid Pro now runs as a 64‑bit application. Yes, that’s very much a change under the hood, but should mean Acid’s longevity is assured for a good while yet, and that it can handle more complex projects on modern computers. At the same time, though, it will run on a pretty modest system, and 32‑bit support is maintained for those who still need it. More obvious to the existing user is the restyling of the user interface. The light grey of old has been replaced by a more modern, darker look that’s perhaps more ‘on trend’ with other contemporary music production software. It’s very much a refresh and not a reinvention, and as a long‑standing user, I think that’s a good thing. As before, the upper section of the display shows a conventional track list/timeline view, while the lower portion provides a multi‑pane, tabbed space that can easily be customised. This layout works well on a single‑monitor setup; if you prefer, or have multiple monitors, then individual panes such as the Mixing Console can be dragged away from the lower zone and floated. 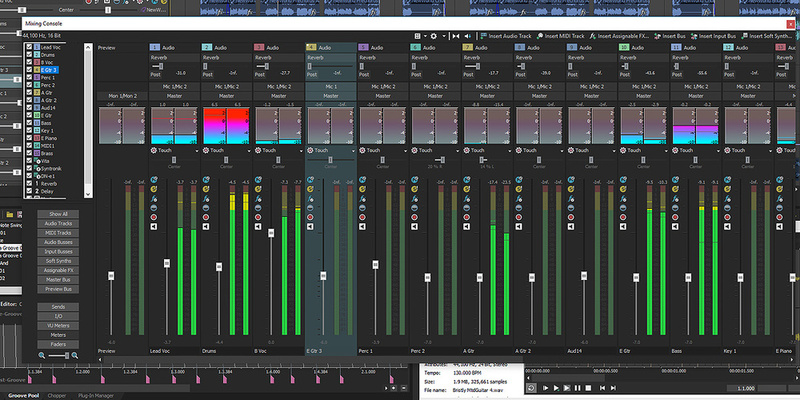 Panes from the lower portion of the user interface can be floated if required, as shown here for the Mixing Console. Given Acid’s history, it’s no surprise that the new version ships with a well‑stocked collection of new audio loops and samples. Approximately 9GB of material is included, in genres ranging from classical, through pop, hip‑hop and EDM and into metal. There are also endless third‑party ‘Acidized’ loop libraries you can purchase, and Magix’s own Producer Planet portal has plenty of additional loops, virtual instruments and plug‑ins to tempt you. As with Magix’s Sound Forge Pro Mac 3, reviewed in SOS August 2017 issue, the most significant ‘value added’ in this release lies in the plug‑in department. Magix say they’ve improved its plug‑in support, and they have added an impressive collection of effects and instruments. It’s not clear exactly what the former involves, but I assume it means more robust and/or efficient handling of plug‑ins. If so, that’s obviously a good thing, and I didn’t experience any obvious technical difficulties using either the included plug‑ins or third‑party effects and instruments. DirectX and VST formats are supported but not, as yet, VST3. Magix have indicated that this will be added shortly in a free update to existing users. 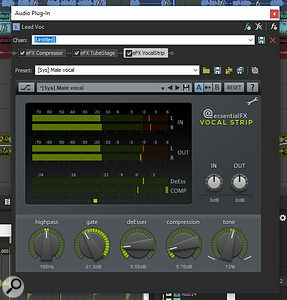 The Essential FX suite provides a good selection of basic plug‑ins, with options such as the Vocal Strip being particularly impressive and easy to use.Most of the added effects and instrument plug‑ins have been around for a while, and will be familiar to users of existing Magix products such as Samplitude, but they are likely to be new and welcome to Acid Pro users. They start with the Essential FX (eFX) Suite, a bundle of 11 effects and processors that includes a De‑Esser, Gate, Limiter, Phaser, Reverb, Stereo Delay, Tremolo Pan, Tube Stage and Vocal Strip (a channel‑strip plug‑in with EQ, gate, de‑esser and compression). These cover some similar functional ground to Acid’s previous Track FX plug‑ins, which are still included, but seem much more on a par sonically with the kinds of audio plug‑ins included in most current DAW packages. In use, I particularly liked the compressor, which is easy to use and sounds solid, along with Tube Stage, which offers some nice saturation options, and VocalStrip; this too is easy to use, with all your key vocal processing requirements handled from a simplified control set in a single plug‑in. The Reverb and Stereo Delay options are fine for routine tasks, but they are neither the richest‑sounding nor the most versatile of their type, so this is one area you might want to supplement with third‑party effects. Users working with lots of vocal‑based projects might also wish to budget for a pitch‑correction plug‑in. 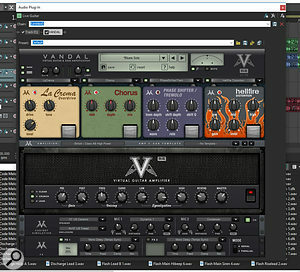 Vandal is a versatile and good‑sounding guitar amp simulator.Acid Pro 8 also bundles Magix’s long‑serving Vandal guitar rig simulator, which includes amplifier modelling, cabinet simulation with a decent selection of cabinet types and options for blending two different microphone models, a handful of overdrive and modulation stompbox models and two slots for post‑amp effects that provide reverb, delay and further modulation choices. Although this is not a challenger to the likes of Guitar Rig 5, Helix Native or AmpliTube, you can coax a good range of tones out of it. I had no problems going from clean to crunch to high‑gain with what’s provided, and if Vandal was your first foray into guitar rig modelling, you could get a lot done before needing to look elsewhere. 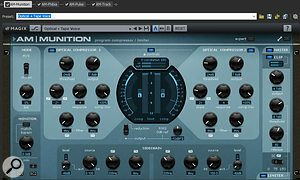 Those who opt for Magix’s subscription package get the Analogue Modelling Suite, which includes the very impressive AMmunition compressor/limiter.AMmunition is an impressive looking (and sounding) compressor/limiter that could most certainly be used on key individual tracks but is, I suspect, primarily intended to sit on your drum or master bus. The range of options is impressive, although the control set does take some exploration. 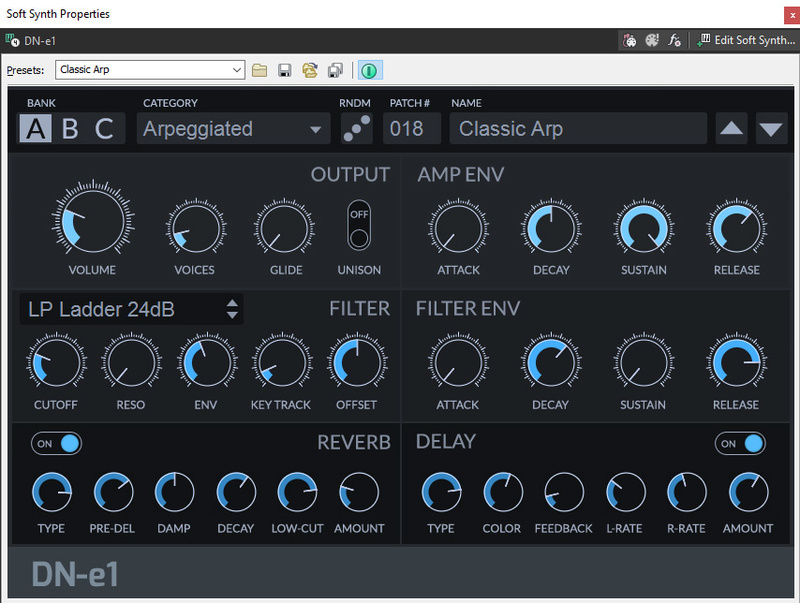 AMpulse is a transient‑shaping tool designed for use with percussion or drums. AMphibia combines optical compressor modelling with pre‑ and post‑EQ filters and ‘character’ options within the compression control set. 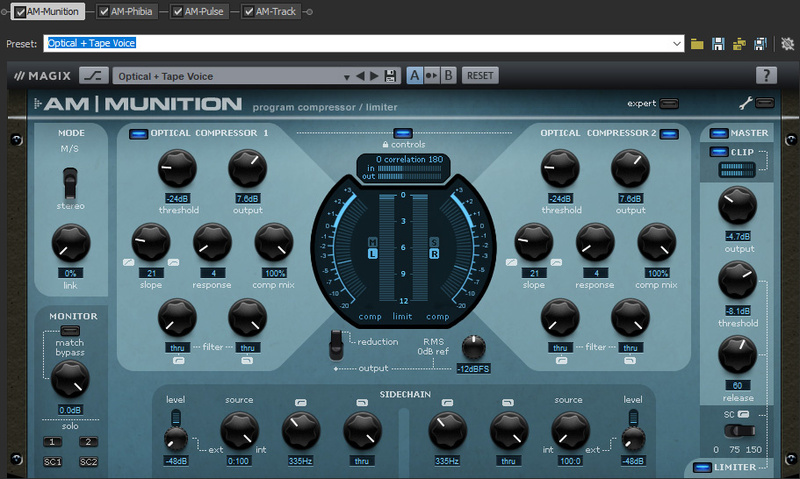 The final plug‑in is AMtrack and combines modelled analogue compression and saturation. Both of these latter two can do some very nice things to vocals. A ‘light’ version of this last plug‑in called AMtrack SE is included in the single‑purchase Acid Pro option as a taster for the full AM Suite. As can be seen from the screenshots, Magix are not attempting to model specific classic hardware devices, but simply to provide the user with some of that sonic vibe. I enjoyed using all four and, while they can all handle more routine tasks where transparent results are required, that’s obviously not their prime intention; they are intended to offer character. It’s not new, but providing you are comfortable with the subscription model concept, the AM Suite is a very worthwhile bonus to Acid Pro’s specification. 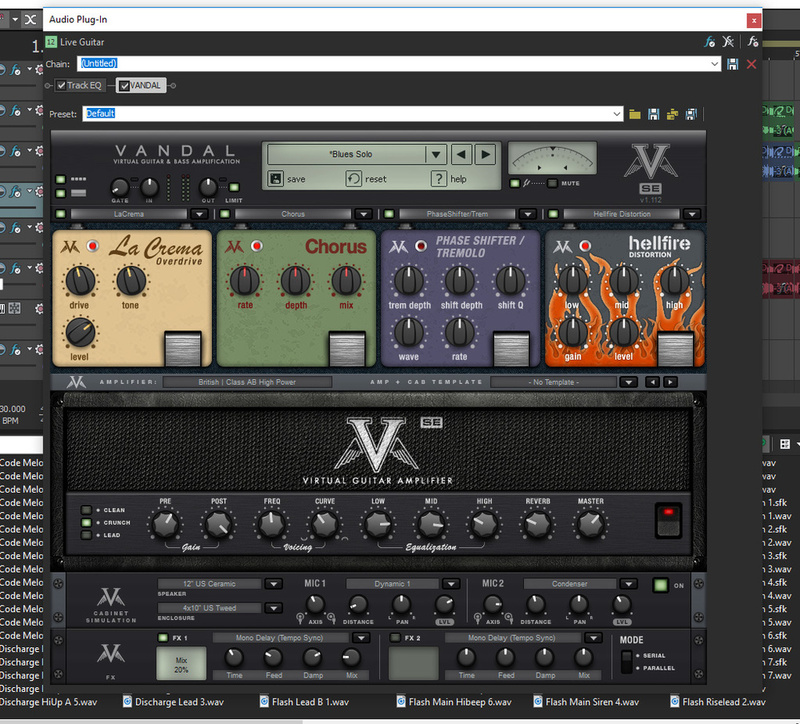 The step up in terms of audio plug‑ins is matched by that made with virtual instrument plug‑ins. Again, those opting for the subscription package get a few bonuses, but the core collection contains 16 instruments and covers a broad range of sonic territory. DN‑e1 is a simple but very effective virtual analogue synth.For vintage to modern synth sounds, the DN‑e1 virtual analogue synth gets things off the ground. While this is not perhaps going to satisfy the needs of a dedicated synth programmer — for example, you don’t get options to tweak the underlying oscillator sound sources — you can select from an impressive set of preset sounds and then fine‑tune the amp and filter envelopes, the filter itself (which offers various filter types and sounds very nice) and tweak the reverb and delay effects. I suspect that the oscillator sound sources are sample‑based, with analogue modelling handling the rest of the sound‑editing options but, whatever the underlying technology, there are some very usable sounds here. Vita 2 is an effective sample playback instrument.A further broad palette of sounds is provided by the Vita 2 instrument. 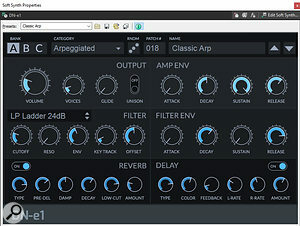 This is a ROMpler‑style, sample‑based instrument and, again, the user gets filter and effects editing options. Instrument categories include a range of orchestra sounds, percussion, a good selection of acoustic, electric and bass guitars, pianos and acoustic drum kits. The sounds themselves are solid if perhaps a little generic: perfectly usable in a supporting role within a mix, but maybe not when soloed. Things do go up a notch or three with the rest of the virtual instrument selection, though. A set of 13 ‘Vita Solo’ instruments, which obviously share some underlying technology with Vita 2, provide more detailed takes on individual instrument types. The list includes Pop Drums, Concert Grand, Church Organ, Electric Piano, Choir, Cinematic Synth, Urban Drums, Drum Engine (MPC‑style sounds), Analog Synths, Vintage Organ, Electric Bass and Jazz Drums. Each of these instruments is supplied with its own dedicated front end and targeted control sets. For example, Concert Grand offers a switch for ‘lid open’ or ‘lid closed’, as well as a range of EQ and effects options, while Electric Bass includes compression, distortion and various modulation effects. Every instrument includes a range of presets and, in some cases, these feature articulation keyswitches. 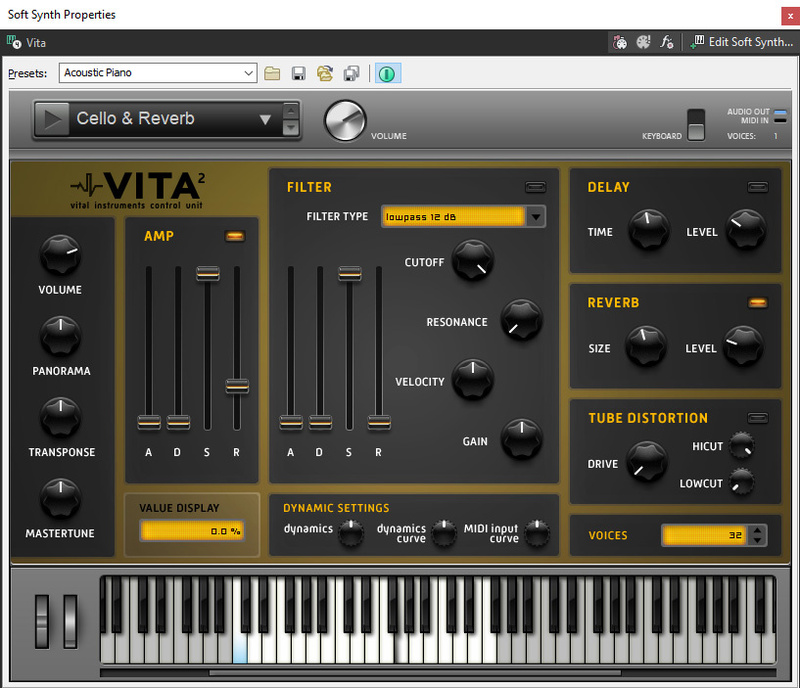 Two additional Vita‑based instruments are included in the subscription package: Pop Brass and Orchestra Ensemble follow a similar format, with a range of presets and front‑end controls for tweaking things like EQ and effects. The core bundle is rounded out by the colourful Vita Sampler. This allows you to slice any audio file or loop and then trigger up to eight slices from the included pads or over MIDI. Files can be dragged and dropped onto the instrument from the standard Windows File Explorer (although, rather oddly, I couldn’t drag and drop from the Acid Pro Explorer pane) and Vita Sampler will then automatically do an initial slicing job for you. You can then customise the slices, set them as one‑shots or to loop and reverse their playback as required. There is also a Random button that generates new slices from the current audio file. While the control set is fairly limited, like all loop‑slicing tools, it’s a lot of fun and a great way to get more mileage out of things like drum loops. Given that this range of instruments is included as part of the Acid Pro bundle, I think the quality is actually pretty good. They perhaps don’t have the degree of finesse and sampling detail you might find in a high‑end (and more expensive) dedicated library, but are most certainly good enough to get some serious music made. The instrument collection would certainly make a great starting point for any musician building a production system from scratch. 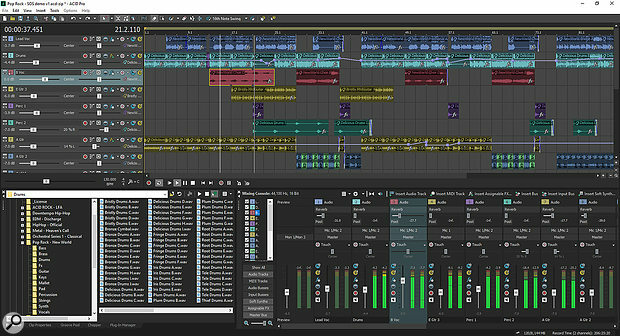 As documented in previous SOS reviews, Sonic Foundry, Sony and now Magix have gradually transformed a dedicated loop‑based production platform into a fully‑fledged DAW. All such products have their strengths and weaknesses, but if Acid Pro 8 was the only music production software sitting on your Windows PC, I think it is fair to say that you would have a pretty sophisticated virtual studio at your disposal. Yes, the loop handling remains a highlight, but Acid is a very competent multitrack audio recording environment, offers enough MIDI sequencing/editing options to get almost any job done with ease, includes one of the best audio quantising systems I’ve ever used, and provides a mixing environment that supports flexible audio routing and automation. Add in the range of additional audio effects and virtual instruments that version 8 brings and this is an impressive all‑round package. Although ease of use is very much one of Acid’s strengths, it does have a few operational quirks that might raise the occasional eyebrow in a user coming from another product. For example, you can only edit parameters within a single audio or instrument plug‑in at any one time, so if you open the FX chain for one track, you can’t open the same chain for a second track simultaneously. This means that you cannot, for instance, EQ your kick and bass tracks side by side to make them work together. It should be stressed, though, that this is a workflow issue, not a limitation in the program’s functionality, and that all DAWs have their own oddities of this sort; most of them are minor, and users just learn to work around them. So, after a (nearly) 10‑year hiatus, is Acid Pro still a contender for Windows‑based music makers? Let me preface my thoughts with a little personal history. After being a Windows‑based musician myself for many years, my primary system became OS X‑based about seven years ago. There were only two pieces of software that I kept hankering for after this move: Vegas Video — for my money, the fastest video editing package I’ve ever used — and Acid Pro. Both, of course, are now part of the Magix line‑up, and I missed them so much that after a couple of years, I bit the bullet and added a Windows system alongside my iMac just to run Acid and Vegas. In other words, I think highly enough of Acid Pro (and Vegas) to spend my own money on buying a machine to run it, even though I have a full Cubase Pro 9.5 rig running as my main DAW under OS X. If, like me, you were already a regular Acid Pro user, I think the simple fact that version 8 is now 64‑bit is probably enough reason to upgrade. And for anyone looking for a first music‑production package, it is certainly a worthy contender, particularly for those who think loops might be central to their music‑making. It will suit some and not others but, as Magix provide a free trial version, finding out is a risk‑free process. For those already well embedded in another DAW environment, I think the argument is a more complex one. As I indicated above, however, even though Cubase Pro remains my DAW of choice, I still use Acid Pro regularly as a complement to it. This is primarily because of its loop‑handling features, with which I’m very familiar and which I find very intuitive. And if Magix were to do to Acid (or Vegas) what Sony did with Sound Forge, and create an OS X version, I’d be on it like a shot. As mentioned earlier, Magix are offering Acid Pro 8 in two different purchase models: a one‑off perpetual licence and a subscription model. Given the feature set, the plug‑in bundle, and the 9GB or so of loops and samples included, I think the price for the traditional single purchase route is a bit of a bargain. First‑time purchasers are getting a lot for their money. Many other developers have experimented with a subscription model; it seems to be something that many computer users are resistant to, but for working professionals, I think it can make a lot of sense, giving clear control over the annual budget for software maintenance. Magix have priced Acid Pro’s monthly subscription at a pretty modest level, and even thrown in some nice plug‑in extras along the way. It might be nearly 10 years since the last major update, but Acid Pro has stood the passage of time remarkably well, and it’s great to see some fresh impetus from Magix. This new version brings the code up to date and adds considerable value with the included plug‑ins; most of these have been part of Magix’s stable for a while, but they will probably be new to Acid users. At what is a fair asking price, Acid Pro is a worthy contender for a first serious DAW, and is affordable enough to make it a good option as a powerful and easy‑to‑use loop production tool to run alongside another DAW. 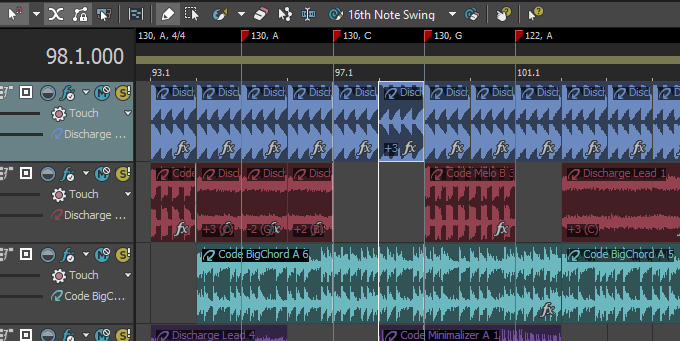 Almost every DAW now includes tools for adjusting the pitch and tempo of audio loops so that they will fit more easily into a given project, and some also include groove‑based audio quantising. However, if you know loops are going to be a strong focus within your own music‑making, the most obvious main contender to Acid Pro is Ableton’s Live. That said, the two applications are different in many ways and, as a consequence, will appeal to different types of user. Live also has a free trial and Ableton offer three paid versions starting at €79, although the Standard version at €349 is where things start to get more interesting. Sonar would also be a contender, as would Bitwig Studio and FL Studio. An alternative approach might be to add plug‑in‑based loop‑manipulation tools to your existing DAW. Ueberschall’s Elastik, for example, is a free plug‑in and offers almost endless ways to manipulate audio loops in real time, but it does require you to purchase dedicated loop content from Ueberschall’s extensive catalogue. Great to see the code brought up to date with 64‑bit support. While it also has all the core features of a DAW, Acid Pro still presents one of the most creative and intuitive approaches to loop-based music production. 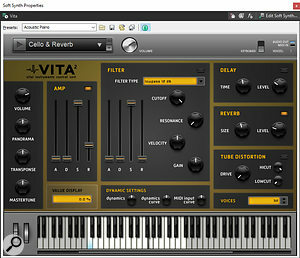 Now includes many more audio plug-ins, loops and virtual instruments. 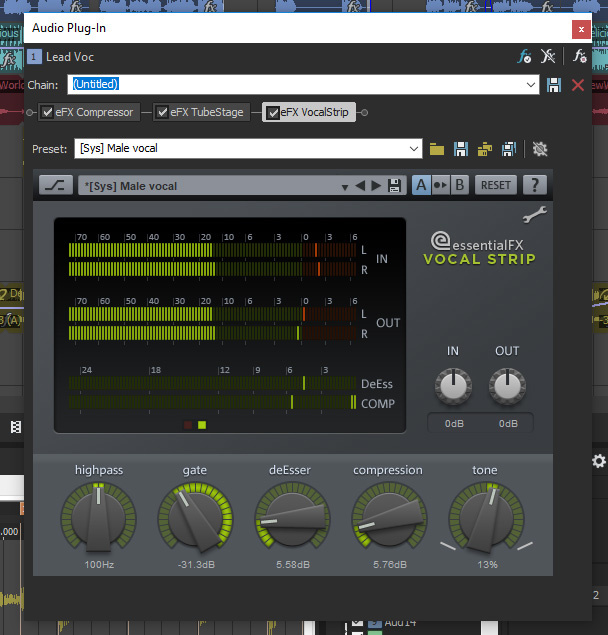 Most of the value added in the new version comes from plug-ins and loop content, rather than new core features. The additional plug-ins are mostly not brand-new but repurposed from other Magix products. Long-term users will be relieved to see new life given to Acid Pro. 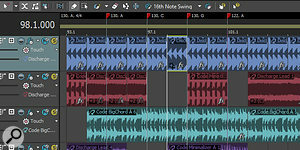 The first release from Magix is evolutionary, but adds considerable value in terms of the bundle of plug-ins included. Either as a loop-based music-production environment or as a full-blown DAW, Acid Pro 8 offers good value for money. $149; subscription from $7.99 per month; upgrades from $99. PC with 3.3GHz Intel Core i5 CPU and 8GB RAM, with Focusrite Scarlett 8i6 interface, running Windows 10 Pro 64-bit. 2 weeks 51 min ago.